Like the title? It’s a little tongue in cheek but hopefully makes you think about maintenance. With summer coming and the heat (finally) starting to hit, we know that some of our customers will see hardware failures due to overheating start to become more common. Most of this can be easily avoided. All it takes is a little preventative maintenance. What we are talking about is no different then getting an oil change, tuning your oven or backflushing an espresso machine. It’s necessary to keep things running along smoothly. There are really three things to consider when checking out your POS. Removing materials from around your POS computer. Are you one of those people with a roll of paper towels on your computer? Do you stack menus on top and around the computer? If so – Stop it! 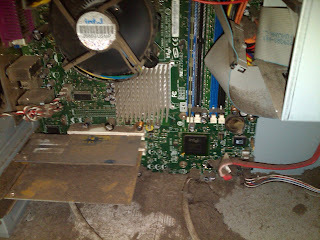 Computers (even those without fans) need air flow. Cleaning. When you have a chance, open the case on your computer and spray it with a can of compressed air. You might be amazed at the amount of dust that fills the air! Do this once every six months and you will extend the life of your computer. Printers. Don’t forget that those printers load up with dust from the paper rolls. Every so often, just open the lid, turn the printer upside down and tap it once or twice. If you need some additional advice, don’t hesitate to contact us!